MAXBORO, Belize District, Mon. Apr. 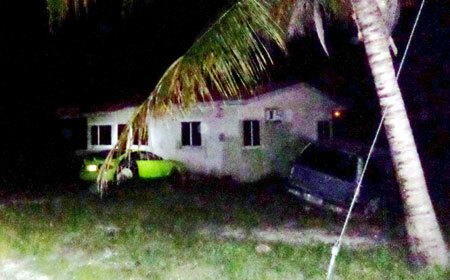 13, 2015–Two children who went to visit their father at 32 Maxboro this evening after school were horrified when they opened his house and found him naked and decomposing in a sofa in the hall of the house. 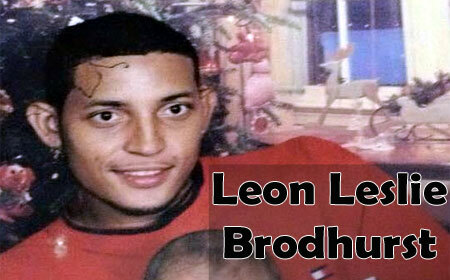 Leon Dennis Brodhurst, better known as Leon Leslie, 31, of Maxboro, had been stabbed about 7 times in the chest and his throat had been slashed. His trousers had been thrown over his face. An onsite autopsy will be conducted on Leslie’s body by Dr. Mario Estrada Bran, police coroner, and his team from the National Forensic Unit at about 6:00 tomorrow morning, after which the body will be buried immediately. Leslie’s stepfather, Steven Staine, told Amandala that he was last seen by the family on Saturday, when he had gone to the house to spend time with them and to have lunch with his mother. He was well, but reported that he had been threatened. At about 6:00 p.m., he returned to his home, and that was the last time he was seen. Staine said that they were not alarmed when they did not see him on Sunday, or during the day today, because he was an excellent mechanic and would be away from his house for days working elsewhere. According to Staine, Leslie had told them that he was having some problems with his neighbors, and with some men, but the problem had been ongoing and it was not that serious as to cause alarm. Staine said that Leslie was friendly and helpful, and had many friends, but some of his friends had enemies, which perhaps made him a target because he associated with them. Leslie’s family has not been able to determine whether anything had been stolen from the house, but they have indicated that they are baffled by the brutal murder of their loved one. Police have launched an investigation, but so far no one has been arrested. Leslie’s wife, Michelle, died eight years ago.